Tired of your friends out-driving you on the links? Mike Wiebe, who has hit a ball 428 yards, can help. 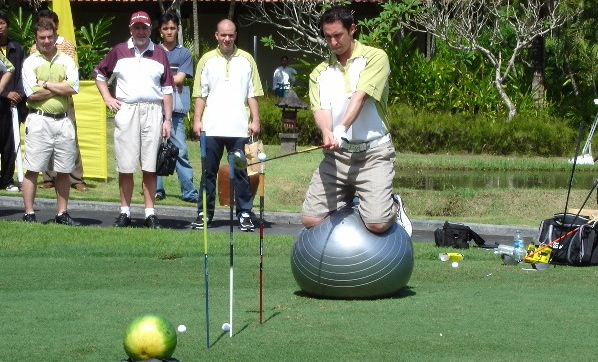 The 35-year-old Toronto resident (pictured above, in Bali) is a seven-time Remax World Long Drive finalist and a respected golf fitness guru, certified by the prestigious Titleist Performance Institute. We caught up with Wiebe for some tips on the long ball. DailyXY: You don’t really have to be in shape to be a good golfer, do you? MW: Fitness is the key to longer drives and better overall golf. Being fit allows you to use your body more efficiently. This will result in more power and more stamina. What are the best exercises golfers can do to improve their driving? Exercises that build strength, increase mobility and improve balance. One that includes all three is holding a medicine ball in front of you, going into a forward lunge and then twisting toward the front foot. Are any specific muscle groups especially important? The two most important areas for the swing are the glutes and the abs. Squats and lunges are great for the glutes, and plank positions (front and side) are great for the core. Has Tiger Woods changed the way golfers think about fitness? There were very few players who worked out at all before Tiger came along. Tiger revolutionized golf by making it an athlete’s game. His take is you wouldn’t hit a football field without training, so why should golf be any different? For more, visit fulltiltgolf.com or email Mike at mike@fulltiltgolf.com.